With more than 150 million people using Snapchat every day, event organizers can no longer afford to ignore the platform. While 60% of users are under 25, more than half of new users are over 25. That means that even if your attendees aren’t on Snapchat yet, they will be soon. The easiest way to use Snapchat for events? Make a Snapchat geofilter for your attendees. By investing only an hour of time and less than $100 of budget, you can engage attendees and spread the word to new ticket-buyers. Here’s everything you need to know about how to use Snapchat geofilters. Snapchat geofilters are graphics (or “filters”) for Snapchat photos that can only be used at certain locations. For example, most cities have geofilters that include their name and a famous landmark, and Snapchat also creates filters for cultural events. Here are some examples of Snapchat’s pre-designed geofilters, which you could edit for your event (find out how below). There are two types of on-demand geofilters: for people, and for businesses. If you’re hosting a professional event, you want to choose a “Business” geofilter. Anyone physically on your event grounds will be able to overlay the filter over their Snapchat images and videos — they don’t need to follow you on Snapchat to access them. That means you’ll get broad distribution without extra effort. And while geofilters cost money, they’re very affordable — usually not more than $10 per city block per hour. Making an on-demand geofilter for your event is a simple three-step process. You choose your design, select the physical area you want the filter to be displayed on, and then submit it to Snapchat for review. All of these steps happen on Snapchat’s on-demand geofilter website. You have two options when designing your geofilter: uploading your own, or editing one of Snapchat’s provided templates on the web. And of course, be sure not to include any information against Snapchat’s submission guidelines, such as contact info like URLs, hashtags, or social media handles. 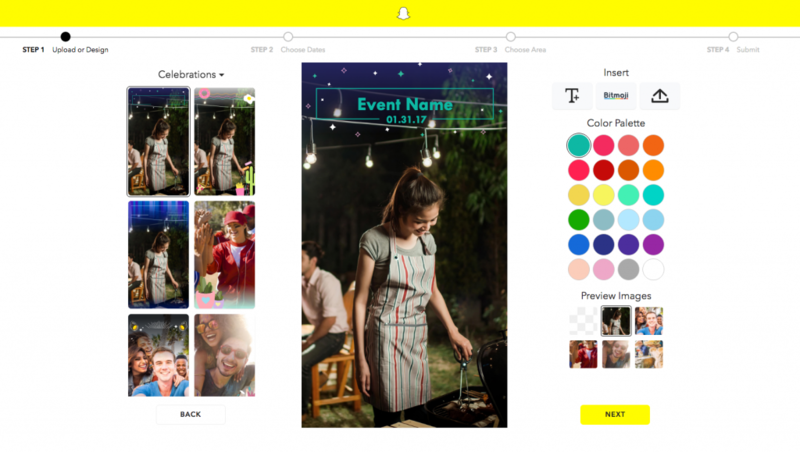 If your bandwidth, timeline, or budget don’t allow for an original filter, Snapchat also has a number of good online templates you can quickly edit to include your event name. Next, you’ll be asked to select the dates and time you want the geofilter to be active. This will likely be the date and time of your event, though it’s a good idea to add an extra hour or two on either end of your event as buffer. The maximum date range for this kind of geofilter is 30 days. Expect to pay somewhere around $10-15 per hour per city block on which the geofilter is active. If you host a repeating event or own a venue, you can buy a geofilter on a long-term basis for a discount. These annual plans are in the $1,000-$10,000 range, depending on your location. The plans allow you to update the creative for each event, and include benefits like additional reporting and discounted pricing. 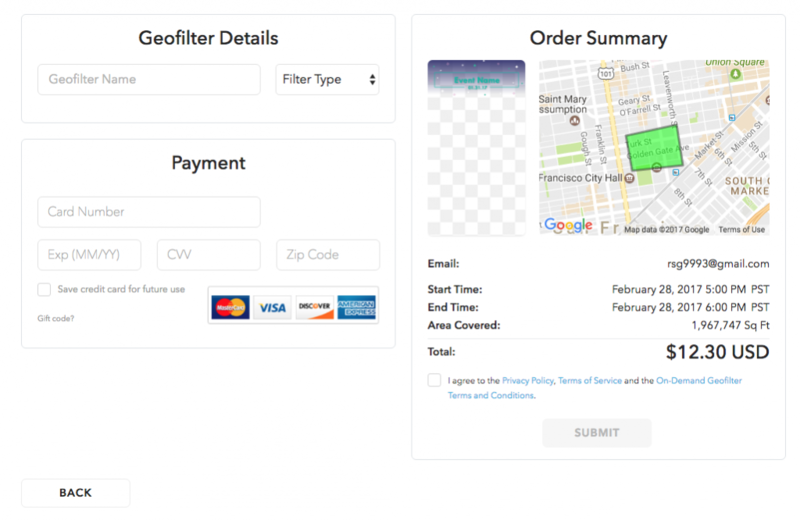 Once you’ve selected the timing of your geofilter, it’s time to define your “geofence” — the physical location where the geofilter will be active. Once again, it’s a good idea to be generous when drawing these lines, since cell phone location services can be inaccurate. You don’t want attendees on your event grounds to be unable to access your geofilter because their phone thinks they’re across the street. To safeguard against this, consider adding the blocks surrounding your venue to your filter as well. The last step is to confirm the details, agree to the terms of service, and pay. Snapchat reviews geofilters within a business day of submission, but it’s best to submit your filter at least a week before the event. This way, if the filter isn’t approved for any reason (which Snapchat would explain), you have plenty of time to edit it. There are no limits to the number of geofilters you can make for your event — just go through the same process as many times as you’d like. Large events often have several filter options for attendees to choose from, but for smaller events one is typically fine. When attendees are on Snapchat, they’ll automatically see your geofilter among their options for editing their photos or videos. When they send them to their friends or add them to their story, those viewers will see your geofilter as well. In that way, you can spread awareness of your brand far beyond your attendees. Geofilters are incredibly popular — you’ll often see pictures with Snapchat filters over them appear on other social networks, because they add creative value to the photo. That said, it’s a good idea to use signage at your event to promote your Snapchat filter alongside your typical signs promoting your other social networks. In one case study, RetailMeNot launched geofilters targeting malls across the country, and one in six Snapchatters who unlocked the geofilter chose to use it. Since your attendees are more actively engaged with your brand than the average shopper, you may see engagement rates well above that. After the event, you can look at your metrics to find out exactly how many people viewed and used your geofilter to see your ROI and find out how you can improve for next time. 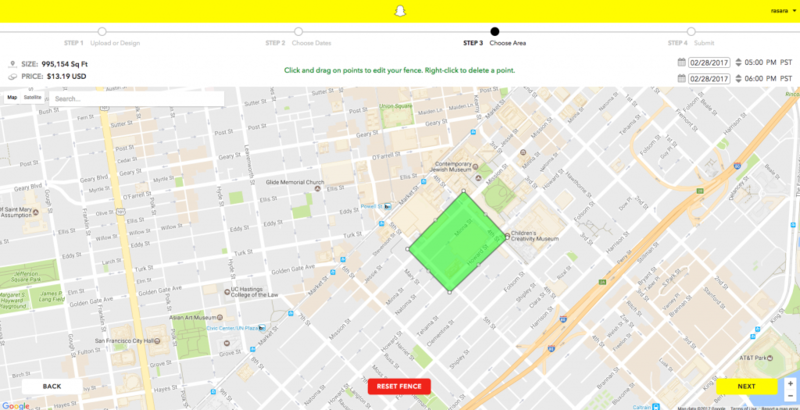 Want to learn more about geofilters and other ways you can use Snapchat to promote your event? Check out this on-demand webinar for insider tips on how to use Snapchat for your event.